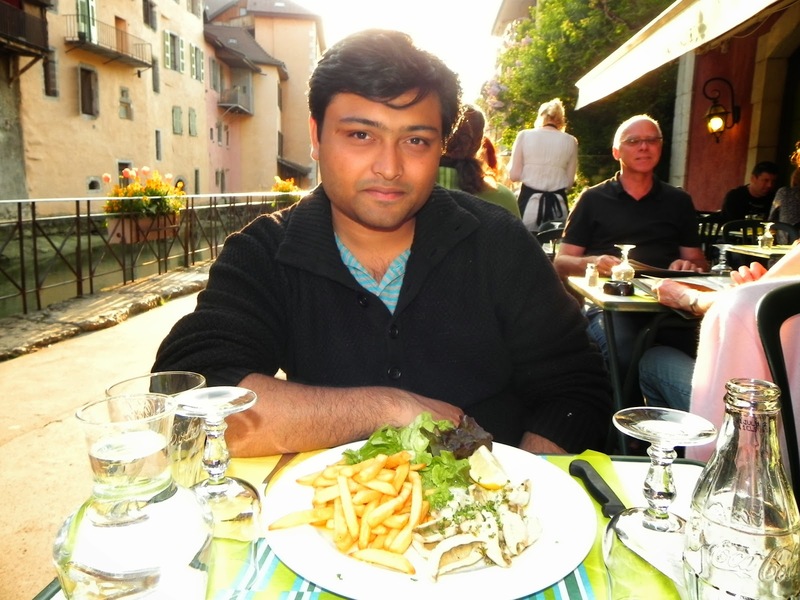 April, 2011 : Mitra finished his courses for the year and had about a couple of weeks off before starting his internship. It was also the week of Easter, though in France the public celebrations for it is rather quiet. Easter is generally spend with family and friends over roasted lamb and decorated eggs. We had just returned from our vacation in the Loire valley, the day before. The trip was pleasant but not satiating enough for our first Easter in France. It was a Saturday and like any other Saturday we woke up late and Mitra was busy pressing random keys on his laptop. Suddenly I saw him animated and the expression he had on his face meant he had found a new plan for our next vacation. Little did I expect that it was for a vacation, for which we would be leaving with just a Sunday in between to spare for preparation. In France the trains are operated by "Société nationale des chemins de fer " or SNCF and they are the most convenient and comfortable and thus not a very cheap method to travel. But from time to time, and mainly during the vacation periods they offer certain reductions on the fares. Mitra's exhilaration was caused, because he bumped upon one such "dernier (last) minute" offer. 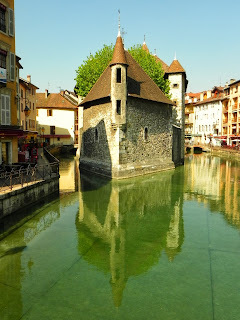 A round-trip of €120 per person for a four hours journey to the French alps was quite a deal and thus we were on our way to the quaint Alpine town of Annecy. When boarding the train at Gare de Lyon of Paris we realized that our ticket was for 1st class. This was enough to assure us that this trip was going to be perfect to wrap up our first year in Paris. 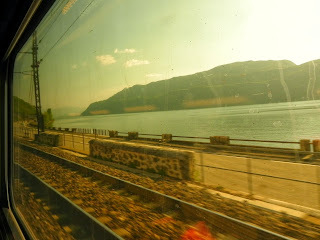 Within two hours our train had crossed Lyon and we had the first sight of the alpine foothills. We had already covered 3/4th of the distance and we started to wonder if the 4 hours travel time was an error on the part of SNCF. The train changed directions at the little town of Aix-le-Bains, on the alpine lake of Bourget, and we realized that an uphill climb is neither easy nor quick. There was also a minor delay on the train due to an unfortunate passenger who had to be transported to a hospital for some reason, which may have been announced on the train but we hardly understood (our level of French in those days was limited to just supermarkets and google translator). 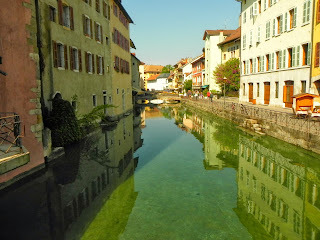 So in just around 4 hours and a few minutes we finally arrived in Annecy. 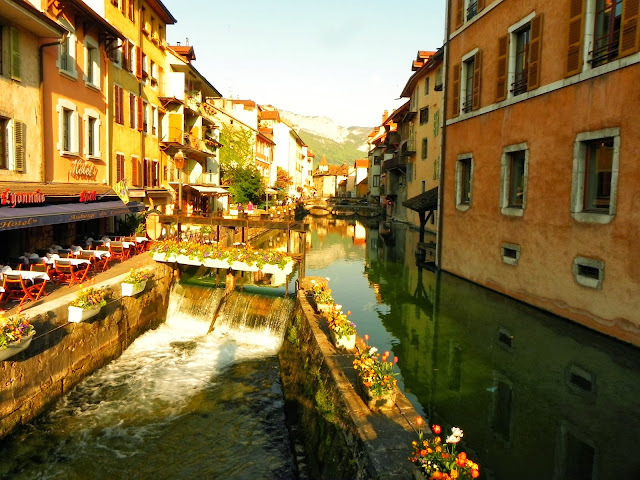 Annecy originated from the ancient Roman city of Boutae and was later settled by the Burgundians who named it the Villa of Aniciaca from where the city took its present name. Around the 12th century Annecy was passed into the hands of the counts of Geneva who made it the capital of the county of Geneva. Thus the present city looks similar to the cities of French Switzerland. 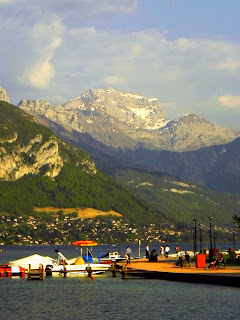 In fact the region Haute-Savoie, of which Annecy is the capital historically belonged to the department of Léman which is the french name for Lake Geneva and is just around 30 km across the mountain pass from Annecy. Annecy has its own lake however, which is the third largest lake in France and is deemed as "Europe's cleanest lake". 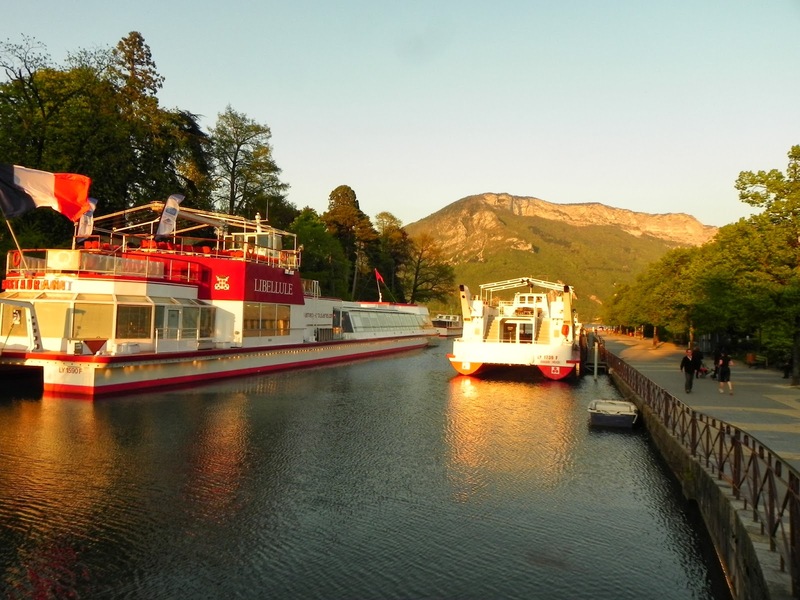 In the early 20th century and just after the two world wars the lake faced an ecological disaster and lake Annecy began to feature in all types of pollution reports. Following the endeavor of Dr.Paul Louis Servettaz, in a quest to save the natural and cultural heritage of this region, and after a massive campaign of purification of the waters, the lake achieved its present distinction as the purest lake since 1962. We checked into our hotel and wasted no time to take a stroll around this beautiful lake. 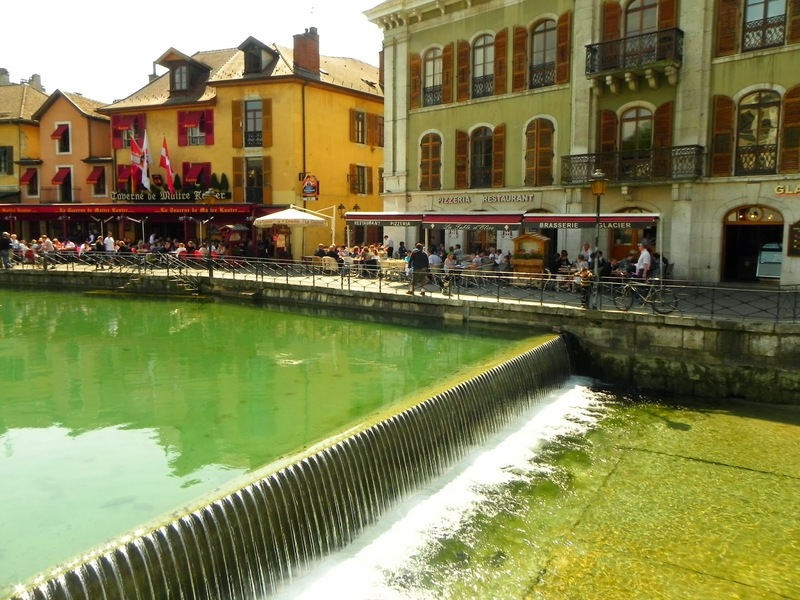 The lake is fed and drained by the little river of Thiou which winds through the heart of Annecy forming canals for which the city is sometimes called 'Venice of the Alps'. It is hard to resist a swim in its transparent pure waters, but the conservation of its purity is ironically the reason why swimming in the Thiou is forbidden. Swimming in the lake is however allowed but the temperature in April was not generally suitable to take the plunge unless you are a fan of Polar Bear Plunges. Weekly cleaning of the Thiou is undertaken and it was scheduled for the day we arrived and we had the opportunity to see how the purity of the lake and the surroundings is maintained. There is a small island on the Thiou where it meets the lake and on it stands the most famous monument of Annecy, the Palais de l'Isle. 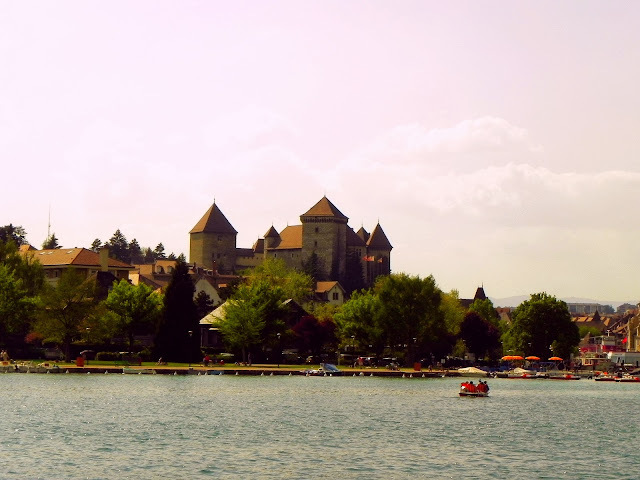 It was built in 1132 as the residence of the Counts of Geneva and later turned into a medieval prison with the fall of the counts. 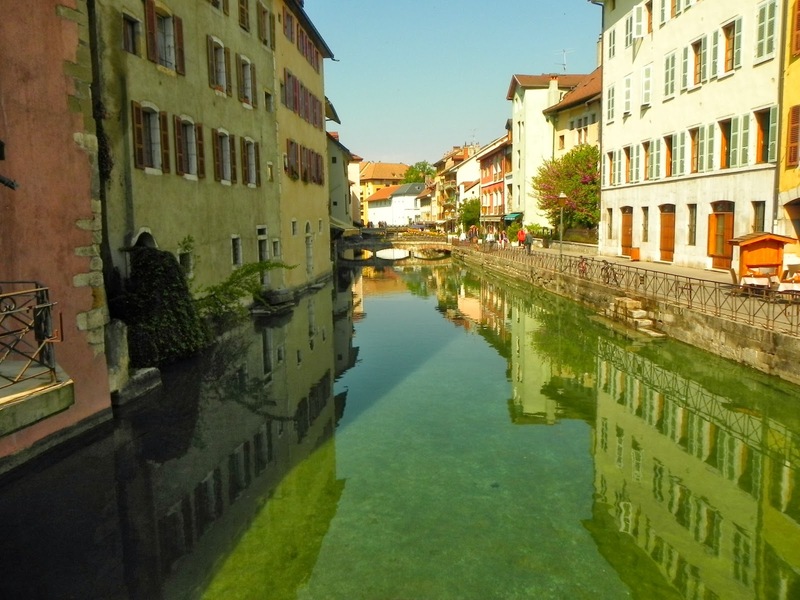 Ever since then Annecy belonged to the House of Savoy. This is the same royal house that ruled over the unified Kingdom of Italy from 1861 until 1946. The origin of the royal house can be traced back to this region and so its influence on the erstwhile Kingdom of Sardinia and the succeeding Kingdom of Italy is evident to this day. A few footsteps towards the lake and we were face to face with the majestic peaks of the Alps. Later that day we realized that one of those peaks is Mont Blanc, the highest peak of the Alps. The snow covered peaks against the blue sky, across the lake was really a sight to remember. We wished to fly closer to the peaks, but a boat ride across the lake was of course a more plausible option. We bought our tickets for one hour cruise around the 14 km long lake and it costs around €14 per head. We had a couple of hours before the departure of the boat and so we decided to get a more personal flavor of the lake on a paddle-boat. Mitra did most (rather all) of the paddling while I was busy enjoying the picturesque landscape which seemed right out of the impressionist painting of Paul Cézanne. Exhausted (Mitra more than me) but invigorated (me more than Mitra) we set out on our cruise on the pristine lake. Due east across the lake are the alpine massifs of Bauges and Bornes. The highest peaks of those two chains, Lanfonnet (1795m) and La Tournette (2351m) were clearly visible as we traversed the length of the lake. Peaking through them should be the massif of Mont Blanc with its majestic peak soaring at a height of 4810m. We are supposed to have seen and photographed it but since we are no geographic expert we are not sure which of those numerous peaks visible across the lake was the famed White Lady. 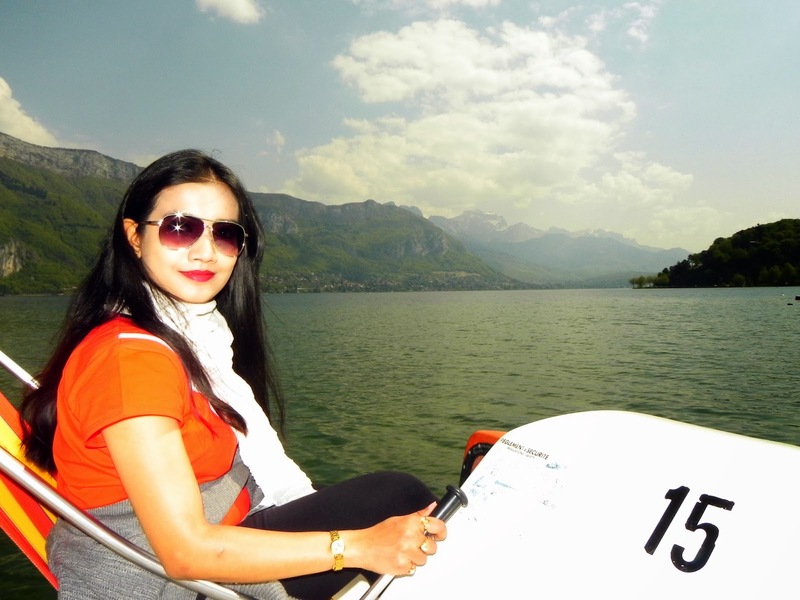 But nonetheless the cruise was breathtaking and the little villages around the lake were charming and enhanced the aesthetic value of the region. It was also there, perched on a small hill on the lake, that we found our dream home and we are ready to buy it, if we can find the owner (it would be difficult though, as even one of Mitra's friends who is from Annecy has no idea of its lucky owner). After the boat trip, now it was time for an early dinner. Fish from the lake was an obvious choice for dinner and we chose perch though the most popular fish is trout, which also figures on the flag and the coat of arms of the city. At the restaurant, we came to know that the weekly market of Annecy was scheduled the next day, and the prospect of finding some local delights made us enthusiastic. 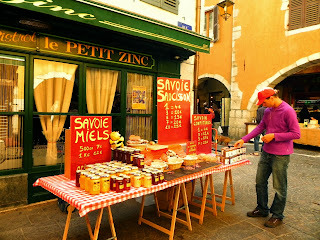 In France, local markets, originally intended for the sale of local produce of the gardens, farms, orchards and various local manufacturing, can offer a guarantee of quality production, while without the transportation and intermediaries, makes for an interesting producer and consumer prices. 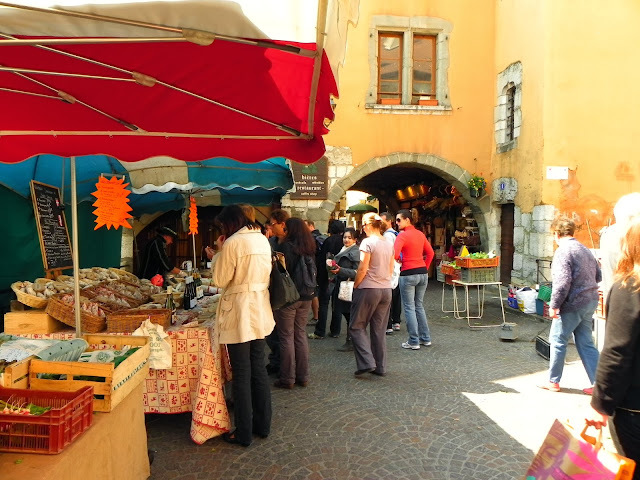 The market of Annecy is very enchanting, with small kiosks dispersed all around the narrow canals formed by the Thiou and the cobbled stoned alleys of the old city center. Local sausage and local cheese such as the beaufort, reblochon or tomme de Savoie is very popular and so is the honey cultured in the rich flora of the surrounding regions. Then we spent the rest of the day walking around the city admiring the scenic beauty and the charming park bordering the lake. The park called the Jardins de l'Europe was built in 1863 to celebrate the city's annexation by the French republic from the House of Savoy. 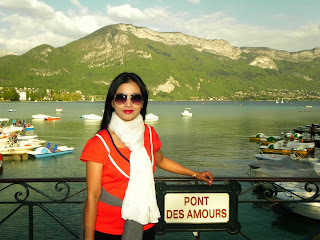 We still cherish holding hands and sharing a passionate moment on the lovely bridge in the park which is aptly called the Pont des Amours (Lovers' Bridge). 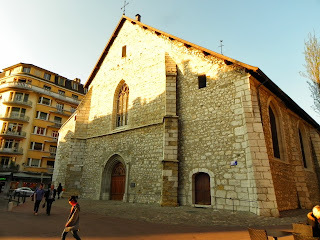 We also had enough time for a uphill climb to the Chateau of Annecy which was home to the counts of Geneva and then the heads of the House of Savoy and to explore the churches around the city. Most of the churches here, though Catholic, lacks the baroque statues which is a characteristic of such structures. The reason for this discrepancy is that the surrounding region of Savoie saw a rise of Calvinist or Protestant reformation during the 16th century and Annecy survived as a catholic city due to one of its most famed residents and bishop Francis de Sales and his gentle approach and unusual tolerance to the religious divide seen in most parts of France in that era. 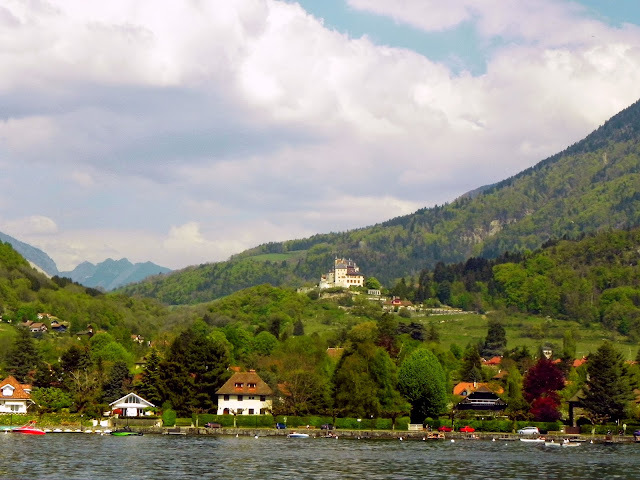 Finally we wrapped up our trip to this alpine beauty by offering ourselves some local chocolate delights from a charming boutique on the edge of the lake as a celebration of Easter. We took our train back to Paris that evening and though the trip to this lovely alpine retreat was more than 2 years ago, it is still fresh in our memory and will remain so for times to come.